My hubby and I met my parents, down in Port Credit, this past Sunday evening. 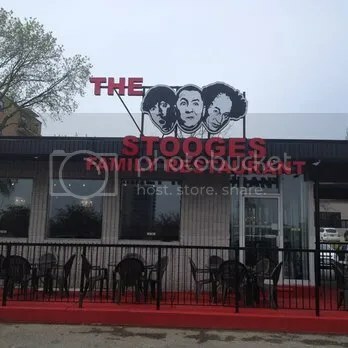 We were hungry, so we decided to try out The Stooges Family Restaurant, located right behind the Starbucks. We had previously eaten at the restaurant, when it was called Helen’s, and always enjoyed their Fish & Chips. So when we saw that The Stooges had Fish & Chips on their menu, we decided to give it a try. Good thing I asked the wait-staff, how big the portions were, because when she said it was pretty big – my hubby and I decided to share. Glad we did too!! 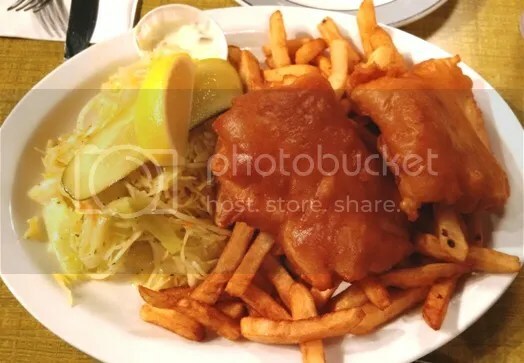 We each got a decent sized piece of Halibut, with fries and a mound of coleslaw to share. The coating around the fish was thin, light and crisp. Can’t go wrong with fries, and the oil/vinegar coleslaw was great too…but I’m partial to oil/vinegar coleslaw over creamy. My Dad got the Fish & Chips as well, and took half of it home. My Mom got the Montreal Smoked Meat Sandwich, and took half of it home well. The prices are reasonable for the portions you get as well. Our Fish & Chips were $16 and my Mom’s choice was either $11 or $14 (can’t remember LOL). If you’re ever in the Port Credit area, give them a try, I’m sure you’ll enjoy it.